The Catholic community in Jammu and Kashmir gathered in Jammu today to celebrate the consecration and installation of the new Bishop of the Diocese of Jammu-Srinagar. Rev Fr Ivan Pereira, hailing from Mumbai and priest of the Diocese, was ordained today as the Bishop of Jammu Srinagar Diocese. The ceremony took place at St Mary’s ground at Gandhi Nagar. The ceremony was presided over by Salvatore Pennacchio, the Vatican Ambassador to India and Nepal and legate of Pope Francis in India. He was assisted in conducting the ceremony by Anil Couto, Metropolitan Archbishop of Delhi, and Felix Machado, Archbishop of Vasai. Priests of the Diocese of Jammu Srinagar, priests of religious congregations, visiting priests, friends of Bishop Ivan and a large number of religious sisters and Catholic faithfuls from Jammu and Kashmir and Punjab were present. Rev Salvatore Pennacchio acknowledged the contribution of Peter Celestine, the former Bishop, and thanked him for his leadership during the last 16 years. He stressed on the element of holiness in the life of a person. Newly consecrated Bishop Ivan Pereira prayed for peace in the state. He called upon everyone to be an announcer of peace in the country. A public reception was arranged at Carmel Convent School auditorium in Kunjwani. Archbishop Salvatore Pennacchio was the chief guest. Director General of Police K Rajendra was the guest of honour. Archbishop Salvatore Pennacchio thanked the government for the support and cooperation it had rendered to the Church. 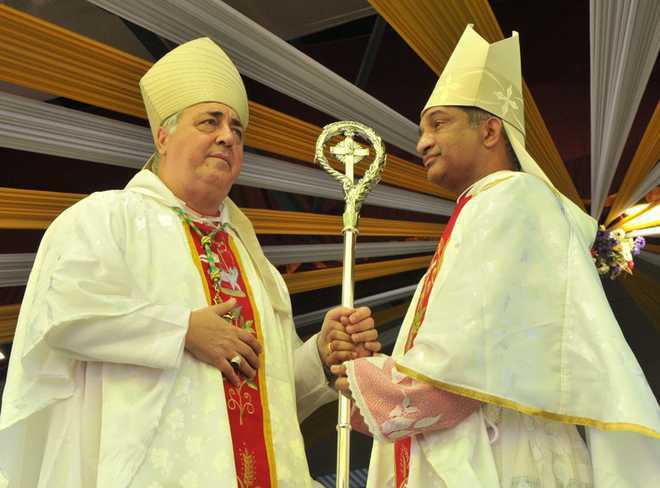 Rajendra felicitated the new consecreated Bishop and recalled the indelible mark the Church had left on society, especially in education, social work and healthcare.